GEL provided all site environmental, permitting, civil design, and contractor oversite to help the Town of Edisto Beach transform an unused Brownfield site into a valuable asset to the community. The technical and permitting challenges were many: a publicly controversial brownfield site with actual and perceived contamination; a site configuration that made redevelopment for a park almost unworkable; contaminated tidal wetlands; regulatory requirements from several branches of DHEC and the Corps of Engineers; and site topography that made flooding common. The site is relatively small (1.25 acre) and the shoreline along the creek had a large incised area formerly developed with a marine rail to haul commercial vessels (shrimp boats, etc.) out of the water for hull repair and painting on the upland. The incised area adversely affected site continuity along the shore, and the shoreline is the primary site attraction. This situation caused site redevelopment to be extremely challenging and almost unworkable. The incised area was tidally influenced and marsh grass had naturalized in portions of it due to disuse. The environmental assessment of sediment in the marine rail area identified contaminants related to the former marine repair operation exceeding ediment screening standards. GEL developed a DHEC-approved remediation plan that allowed the sediment to either be excavated on capped. Both options required permits from both the Corps and OCRM since the activity would be conducted in a tidal wetland. Filling tidal wetlands is difficult to permit due to the high standards such projects are held to. In particular the capping option had the additional likelihood of requiring wetlands mitigation of coastal saltwater wetlands, and there is not a mitigation bank for this type of wetlands. Furthermore, a stand-along mitigation plan would be time consuming and costly, and would potentially have delayed the project schedule indefinitely. Despite these challenges, filling the marine rail area wetland had the potential benefit of removing the incised area and allowing the construction of a straight bulkhead along the entire waterfront. After evaluating potential mitigation alternatives, GEL was able to work in concert with both OCRM and the Corps, and demonstrate that filling the wetland would meet site remediation needs and should thus qualify for permit approval. Additionally, GEL was able to document that the project had significant public benefit and was being conducted by a public entity. Thus the site was eligible for filling without any required mitigation. While this outcome is allowed by regulation, it is rarely obtained from both agencies due to the high standard and special circumstances that such a permit application would be held to. GEL was able to recognize the unusual combination of site conditions that made this outcome obtainable. This outcome allowed for both protection of the environment by isolating the impacted sediments from the marine environment and maximizing the use of the waterfront to the benefit of the public. GEL's services included working with DHEC on the brownfield Voluntary Cleanup Contract (VCC); performing all site soil, sediment and groundwater assessment; designing site remediation in both the upland portion of the site and in the tidal wetlands; obtaining all DHEC remediation approvals; obtaining wetland fill permits from the Army Corps of Engineers (Corps) and DHEC-OCRM; bulkhead design; pier permits; grading plan; and contractor oversite. 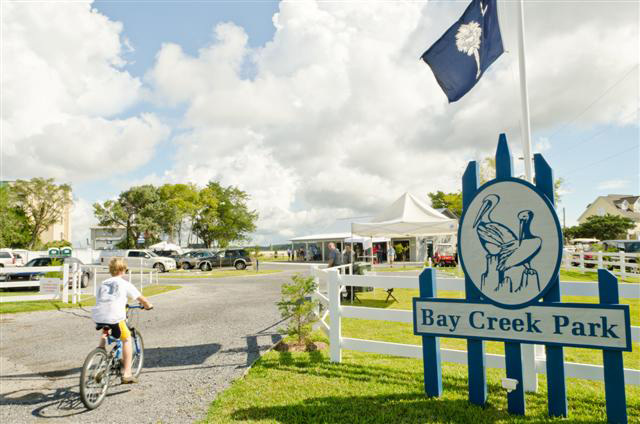 The Bay Creek Park site now provides needed access, as well as the location of an interpretive center, a Farmer’s Market, a place to crab, fish and picnic, and a location for large outdoor events.